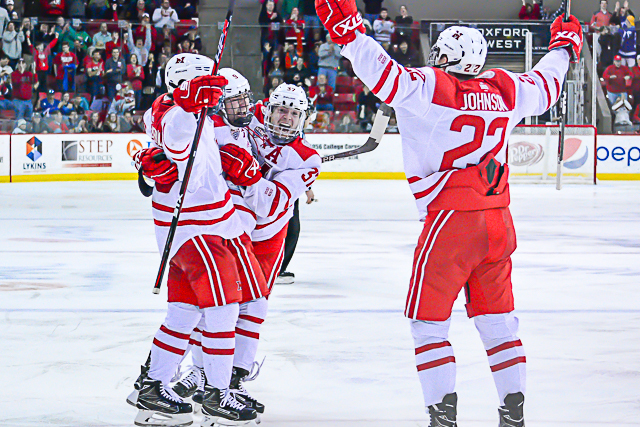 OXFORD, Ohio – More than ever, elite hockey players are choosing college as their path to the pros, leading to an increase in the number of early departures among high draft picks in the university ranks. 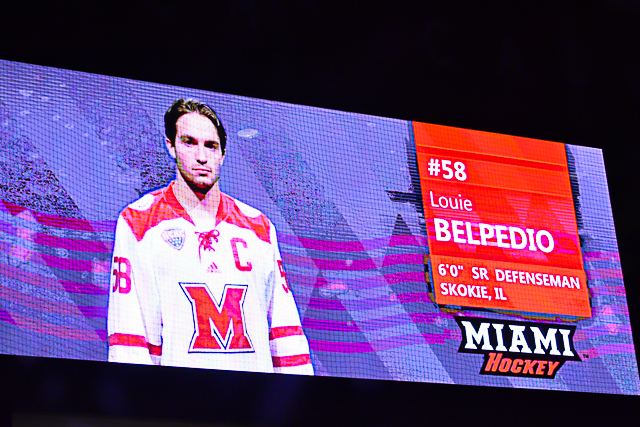 Louie Belpedio has faced the arduous decision to turn professional multiple times during his Miami career. 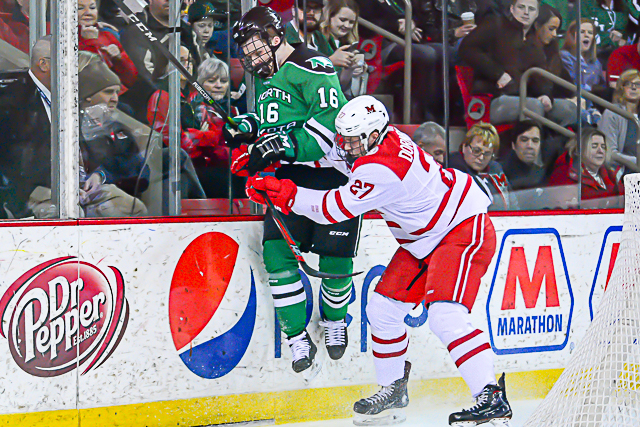 Louie Belpedio skates around a defender (photo by Cathy Lachmann/BoB). The third-round NHL pick’s choices? Sign and take the money while maneuvering closer to the dream of an NHL career, or remain in school as an amateur. Each time, the two-year captain has picked Miami. 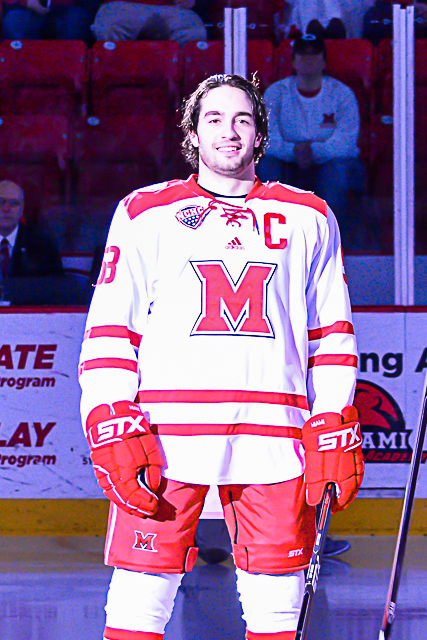 Now a senior, Belpedio is one point away from tying Matthew Caito for eighth place on the RedHawks’ all-time defenseman points leaderboard, and his wait to join the paid-to-play ranks is nearly over. 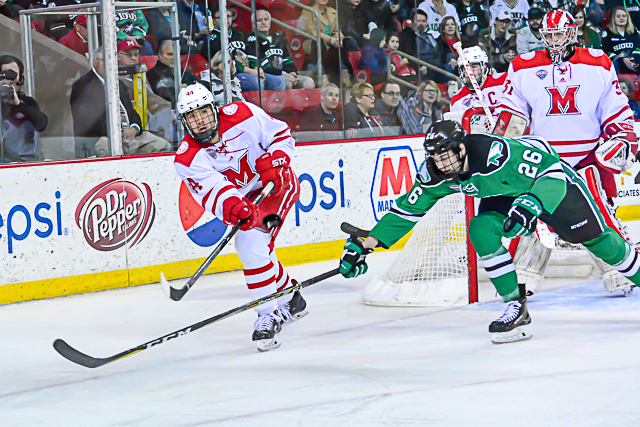 After captaining the U.S. National Development Under-18 team to a gold medal while racking up 23 points in 61 regular season games, the 5-feet-11, 194-pound Belpedio was selected 80th overall by the Minnesota Wild in June of 2014. 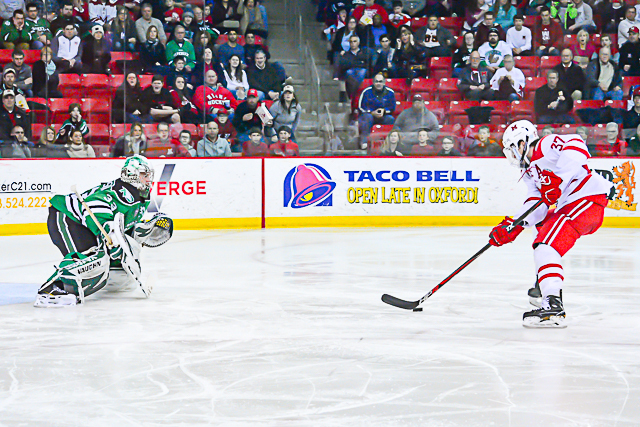 Belpedio is from Skokie, Ill., a northern suburb of Chicago, and a month before he was drafted, the Blackhawks knocked the Wild out of the playoffs in the conference semifinals. The following season, Chicago would again end Minnesota’s season in that round en route to a Stanley Cup championship. 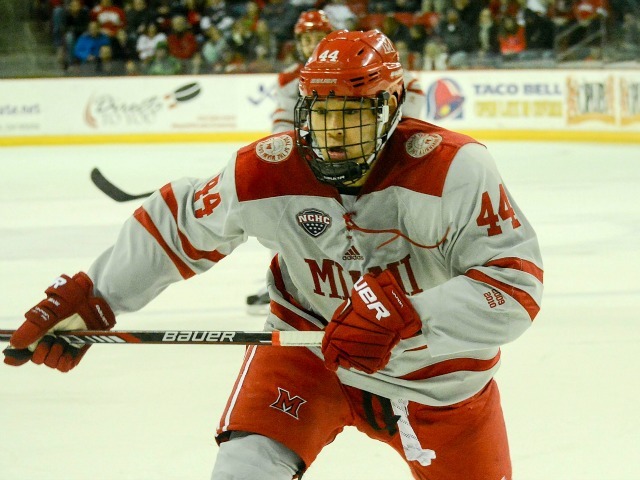 Minnesota has taken interest in several Miamians in recent years, as Jarod Palmer, Pat Cannone and Marc Hagel have all played in the Wild’s system. The former two made the big club. 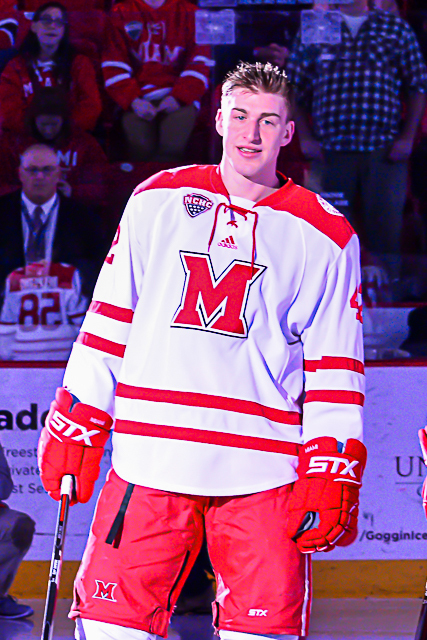 Ryan Jones is the only other Wild draft pick to play for the RedHawks, although that was under a different set of team brass and Jones was traded to Nashville before making his NHL debut. 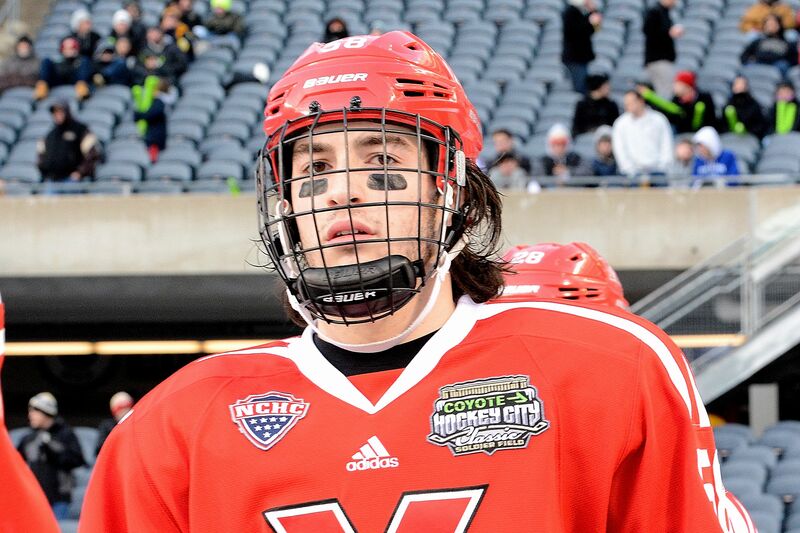 Belpedio was already skating by age three and joined a team before starting elementary school, and although the three-sport star also played football and baseball through eighth grade, he gave them up to concentrate on hockey. By junior high, Belpedio’s talents were evident, but rather than graduate to midgets like most area standouts he relocated to upstate Indiana where he attended Culver Military Academy. Away from his family and homesick, Belpedio wasn’t always a fan of the regimented boarding school lifestyle, and long hours at the rink helped him escape Culver’s military drills. 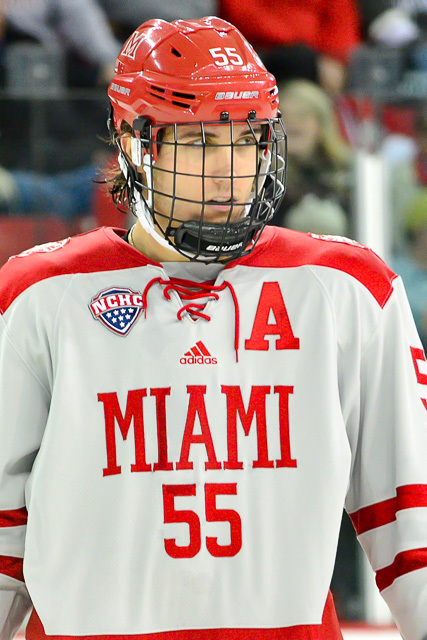 After two seasons, 61 regular season games, 11 goals and 25 assists, Belpedio was invited to play his junior and senior campaigns with the U.S. National Development Team. He finished with a goal and 10 assists as an Under-17 and was named captain the following season. That U18 team won the World Juniors gold medal, and Belpedio was drafted that spring. 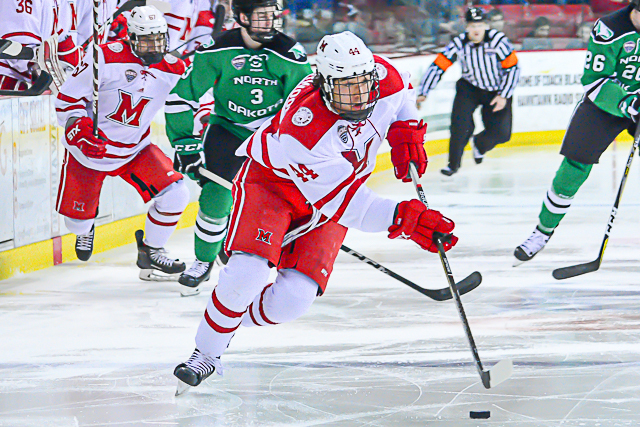 Belpedio had chosen Miami before being selected by the Wild. Knowing nearly one-third of the RedHawks’ roster of fellow Chicagoans swayed his decision. “I kind of felt: Not that I had to come here, but I wanted to come here and be the next on the Chicago-to-Miami train,” Belpedio said. He said Oxford reminded him of Culver in some ways, including the building styles. “And the whole girl thing isn’t too bad either,” Belpedio said. “There was kind of lot going into (the decision), honestly, but the second I visited – I didn’t commit right away but I told my dad I was coming the second we got in the car after leaving the rink,” Belpedio said. 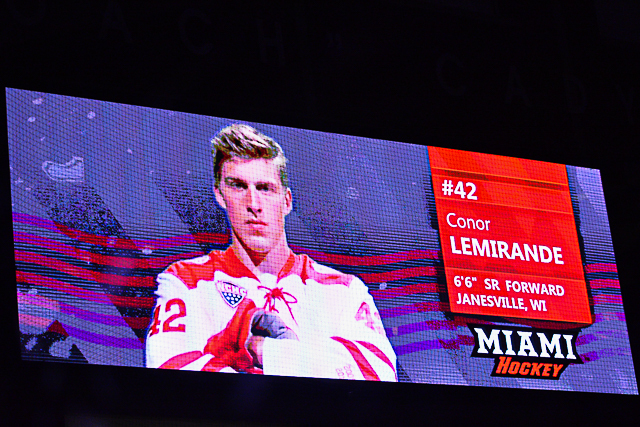 One of Belpedio’s cousins on his mother’s side is former RedHawks defenseman Vincent LoVerde, a 2011 graduate who played 159 games for Miami and was one of the best shut-down blueliners in the Cady Arena era. 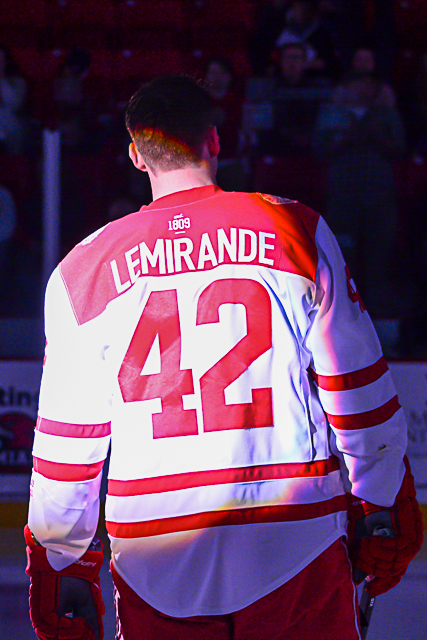 LoVerde has played over 400 pro games and is currently with the Toronto Marlies of the AHL. 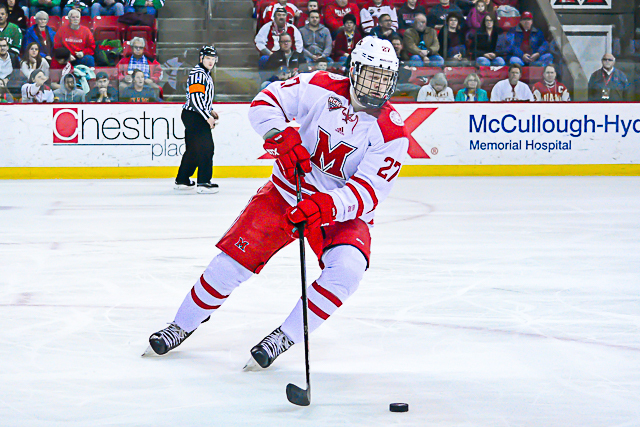 Just three months after his 18th birthday, Belpedio headed to Oxford for the 2014-15 season. Especially at that age, freshmen typically need to adjust to the collegiate game, but Belpedio jelled immediately with his new teammates. He scored six goals and dished for 13 assists, totaling 19 points. 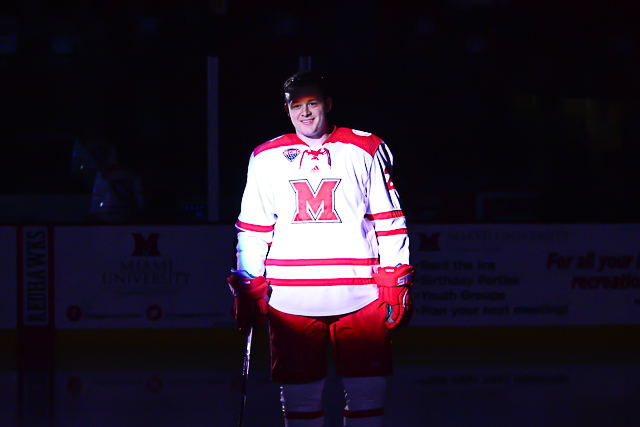 Belpedio walks onto the ice at Soldier Field as a freshman (Cathy Lachmann/BoB). He dressed in all 40 games that season, including an outdoor contest vs. Western Michigan at Soldier Field, an NCHC championship game and an NCAA Tournament appearance. With Belpedio growing up a handful of miles from the Chicago Bears’ home stadium, 100 members of his extended family as well as his circle of friends were able to attend that matchup vs. the Broncos. 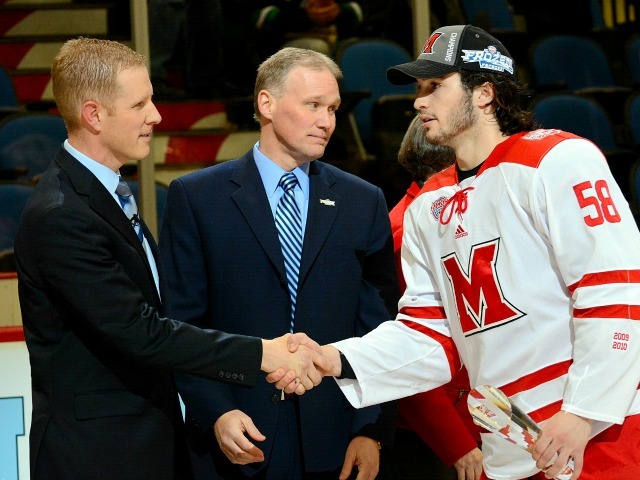 Belpedio shakes the hand of NCHC commissioner Josh Fenton after the 2014-15 NCHC final (Cathy Lachmann/BoB). 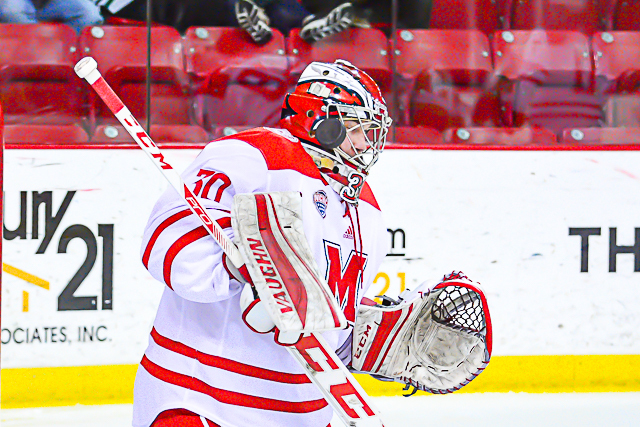 Belpedio calls the RedHawks’ 2014-15 league tournament run the highlight of his career. 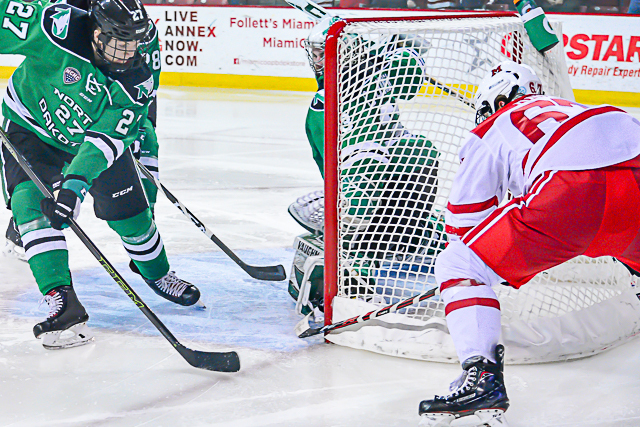 He scored twice and dished for two assists in five NCHC postseason games and picked up a helper in Miami’s NCAA Tournament loss to Providence. 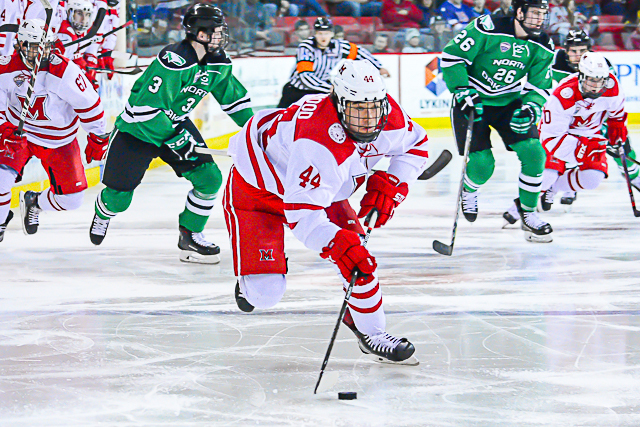 During the NCAA first-round regional, Belpedio famously skated full speed more than halfway down the ice and dove to knock a would-be empty goal away from his net before jamming into the boards at maximum velocity. Belpedio as a sophomore (Cathy Lachmann/BoB). 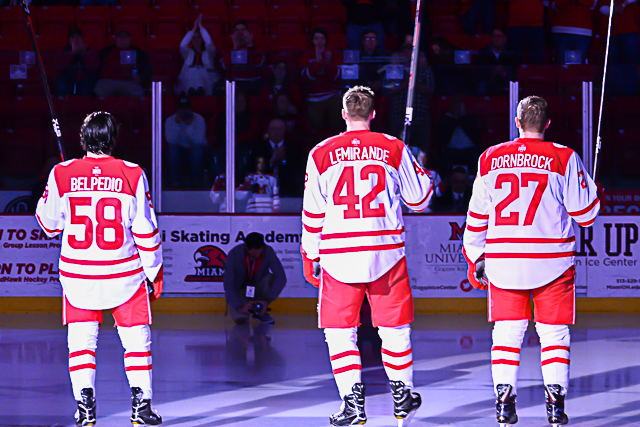 As a sophomore, Belpedio was named an assistant captain – a rarity for the RedHawks. 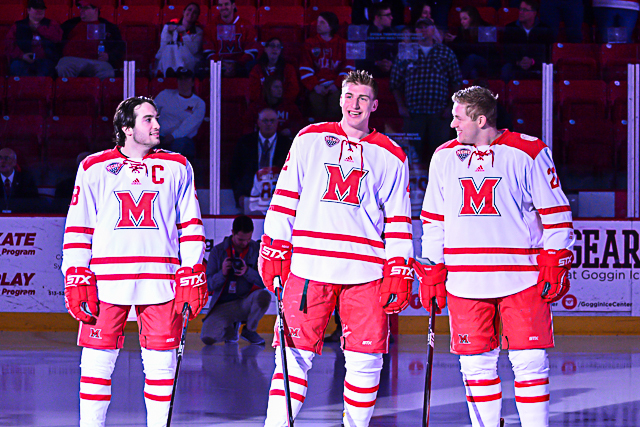 He said the senior captains, Sean Kuraly and Kevin Morris, were instrumental in helping him adjust to wearing the ‘A’. 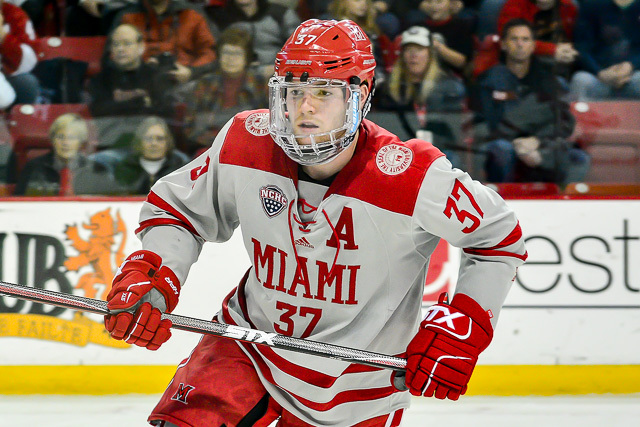 Belpedio went 4-13-17 as a sophomore and left Miami for two weeks over the holiday break, as he was named assistant captain of the U.S. World Juniors team that won the bronze medal in Finland. Named captain prior to his junior season, Belpedio passed along what former letter wearers had taught him. Junior and fellow blueliner Grant Hutton was a freshman in 2015-16 and said his adjustment to Division I was facilitated significantly by Belpedio’s unselfishness. Hutton attributes much of his own offensive success to Belpedio. 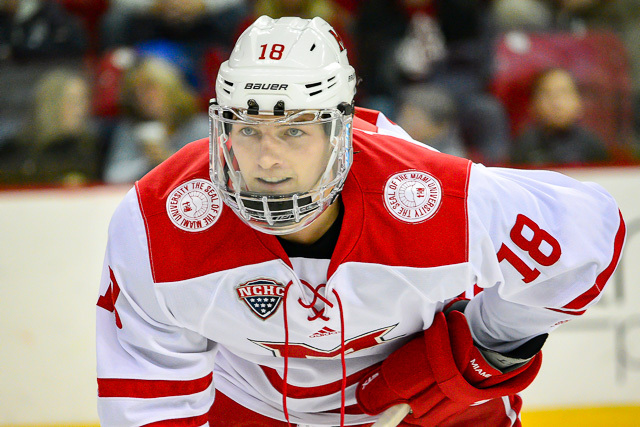 Held without a goal his freshman season, Hutton netted nine as a sophomore and has 10 more in this campaign. Belpedio dons the ‘C’ as a junior (Cathy Lachmann/BoB). 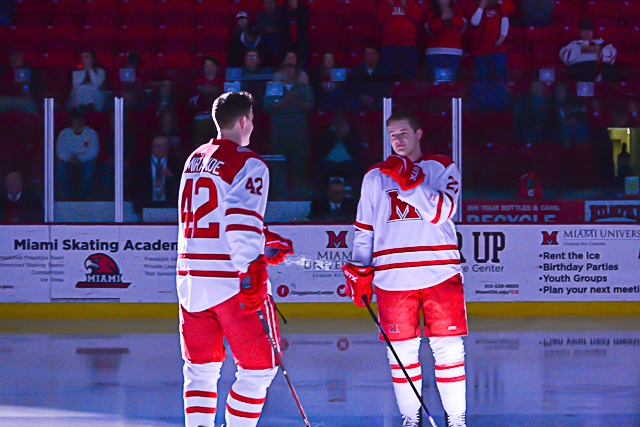 The captaincy at Miami has proven a difficult title for even the most successful RedHawks. 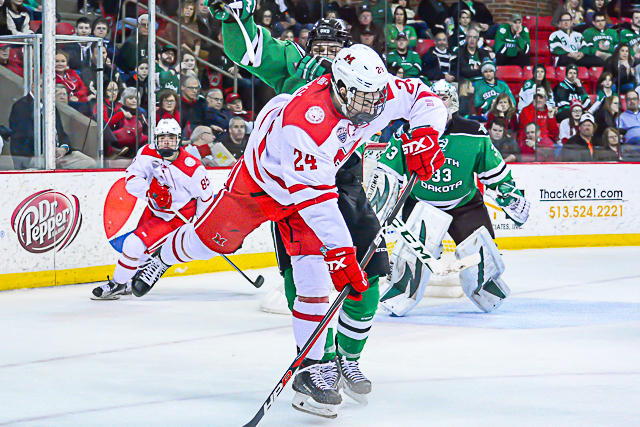 Just in the past few years, Austin Czarnik wasn’t initially stern enough with his teammates and Kuraly did not score until the 12th game of his senior season while wearing the ‘C’. Though Belpedio scored six times and set up 11 more goals, he was limited to 24 games as a junior. He pulled his hip flexor first weekend of the year and missed first six games as a result. His first game back he jammed his thumb into a medal divider in the boards at Ohio State and tore a ligament. Belpedio was unable to squeeze his hand for the next three weeks. Then a knee injury cost him the final six games of 2016-17. 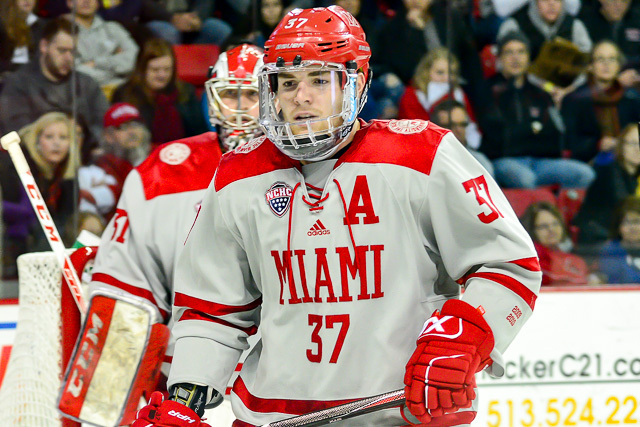 This season, Belpedio is tied for fourth on the team with nine goals, is tied for Miami’s assists lead with 19 and is even with Josh Melnick for second in points (28). 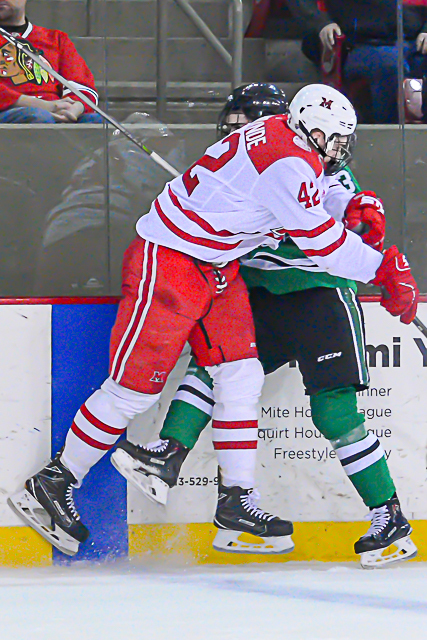 Belpedio was named to the all-NCHC’s second team, is second on the RedHawks in blocked shots (40) and is second in plus minus (plus-3). 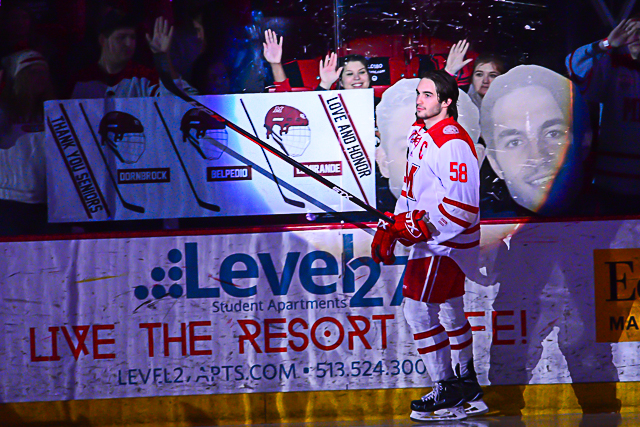 Belpedio is honored on senior night (Cathy Lachmann/BoB). 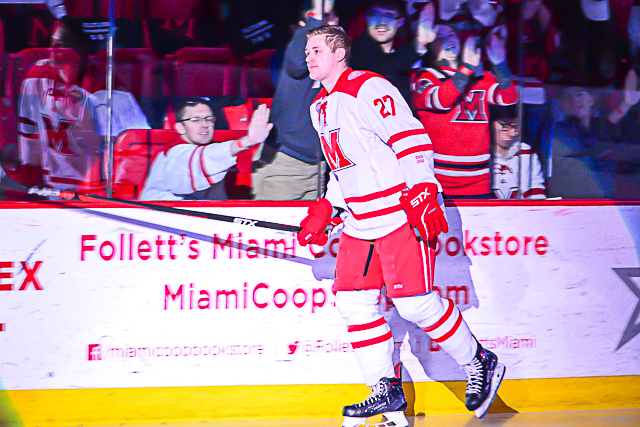 For his career, Belpedio is ninth all-time in RedHawks defenseman points and fifth in blueliner goals with 25. 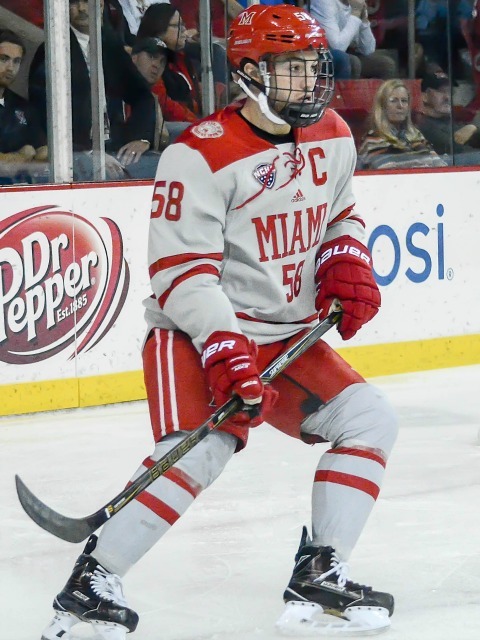 On pace to graduate with over a 3.0 grade-point average as a sports management major later this spring, Miami’s season could be down to its final days and the call of the pros may be too strong for Belpedio to resist any longer. 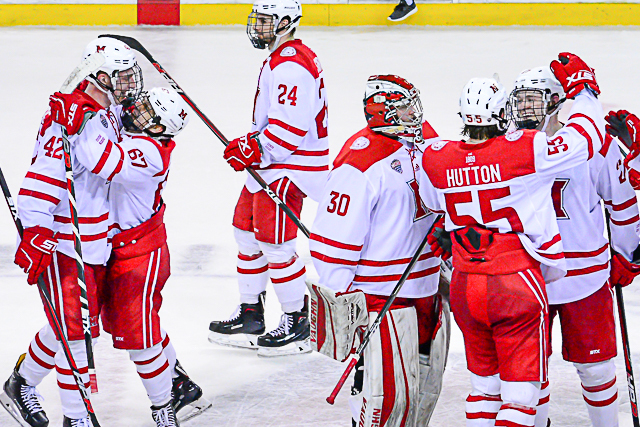 “He cares more about this program, the Brotherhood, than anyone I’ve ever known, and he’s always been someone you can rely on to put a smile on your face when you need it,” Lemirande said. Despite any possible missed opportunities in the pros, Belpedio he has no regrets about remaining in Oxford for a fourth college season. 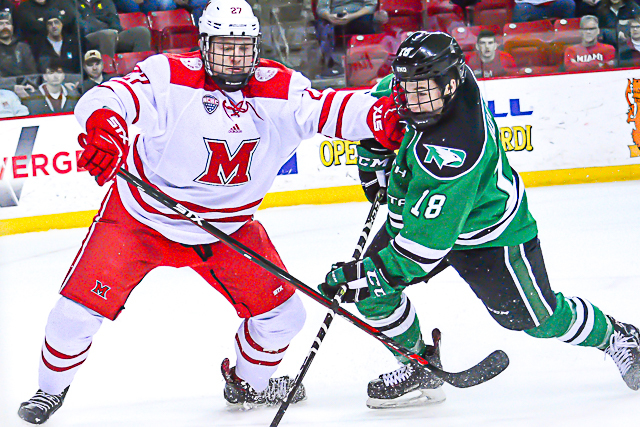 Images from the series played between North Dakota and Miami University at Cady Arena in Oxford, Ohio, on Feb. 23-24, 2018. All photos by Cathy Lachmann/BoB. 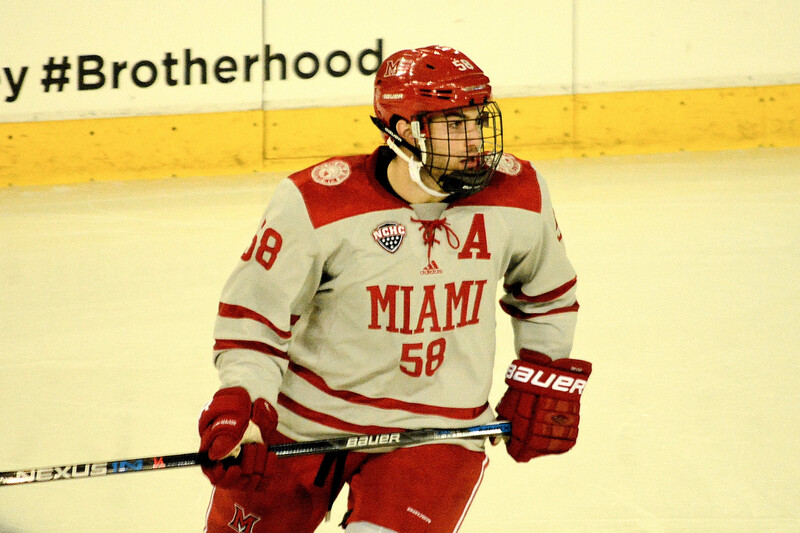 OXFORD, Ohio – On Friday, Miami battled back from three down to win. One night later, No. 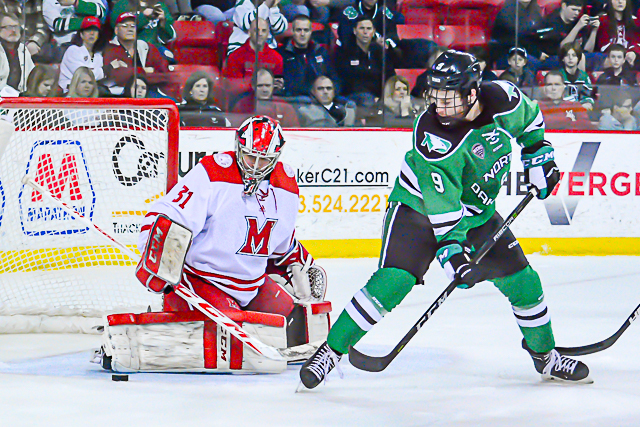 12 North Dakota was the team overcoming a multiple-goal deficit. 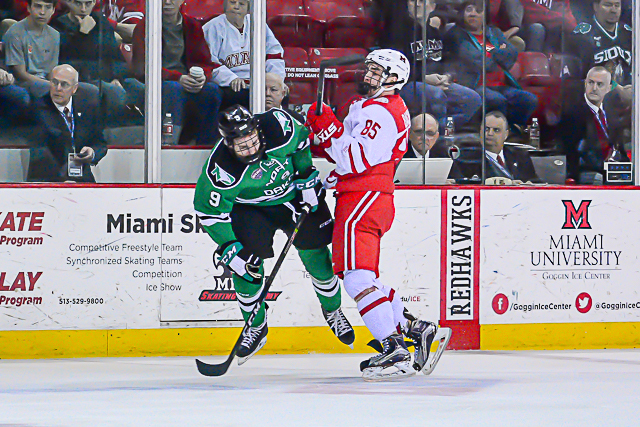 But unlike the RedHawks, the Fighting Hawks were only able to salvage a tie after evening the score on a pair of third-period goals for a 2-2 draw at Cady Arena on Saturday. 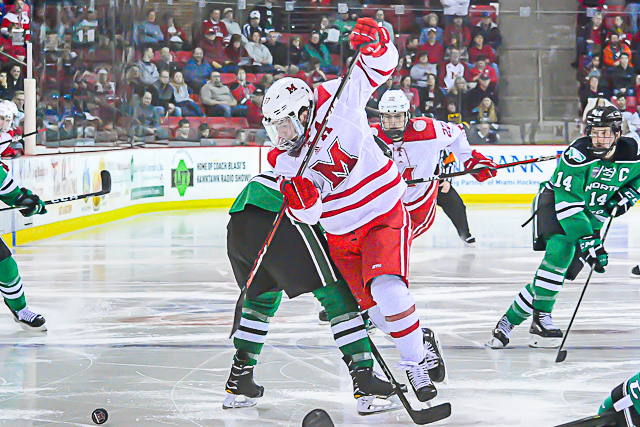 Miami (11-17-4) earned the extra point in 3-on-3 play after the game was officially ruled a tie, giving the RedHawks five of a possible six points on the weekend. 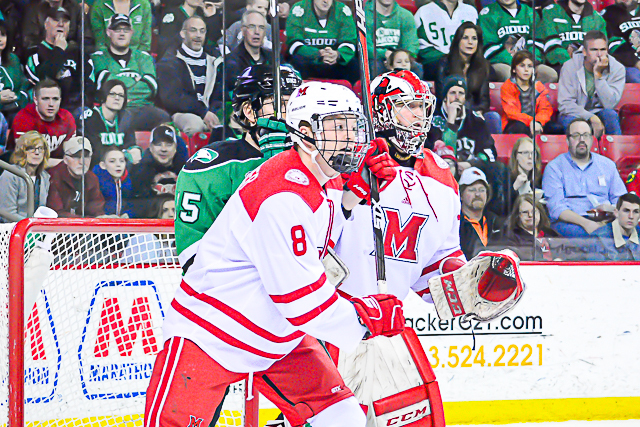 Despite the strong showing this weekend, Miami clinched last place in the NCHC. 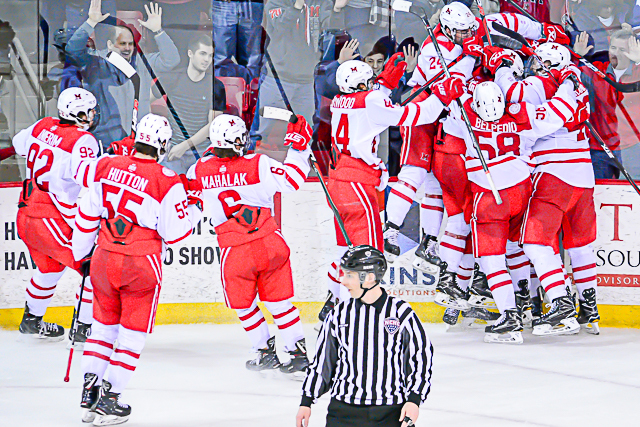 Three teams are tied for fifth, six points ahead of the RedHawks. All have two regular season games remaining. 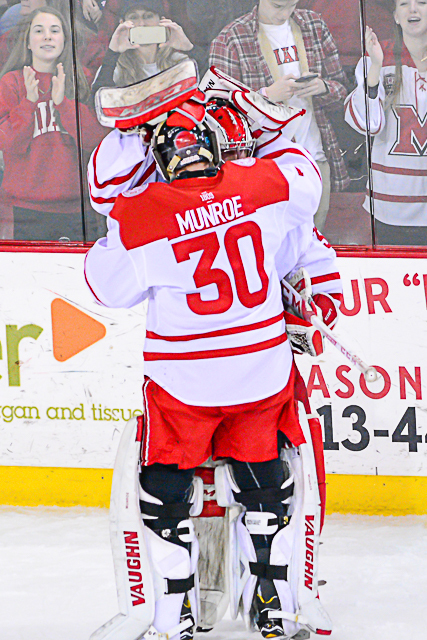 So it is possible for MU to tie at least one of those three, but Miami cannot win a tiebreaker against any of them. After the completion of this game, St. 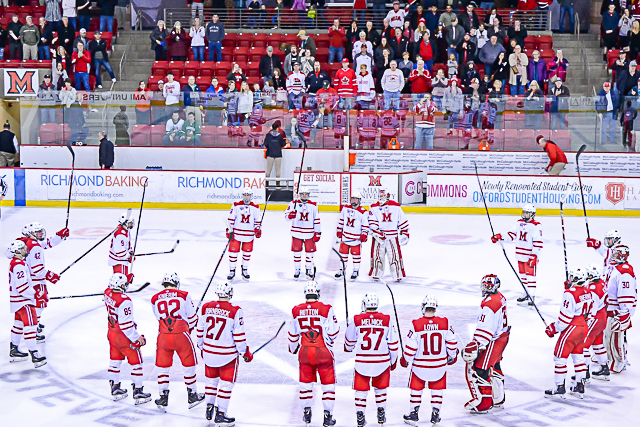 Cloud clinched the conference title, so the RedHawks will travel there for their first-round NCHC Tournament series in two weeks. 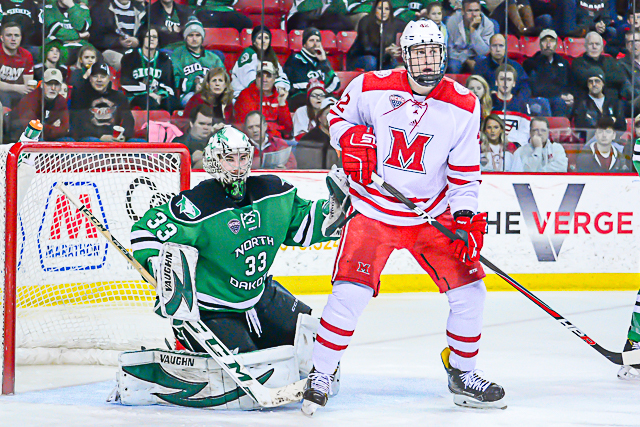 RECAP: The teams were scoreless after the first period, but Miami’s Josh Melnick gave Miami the lead when he stole a puck at his defensive blue line and skated in for a breakaway, pounding the puck into the pads of North Dakota goalie Cam Johnson. 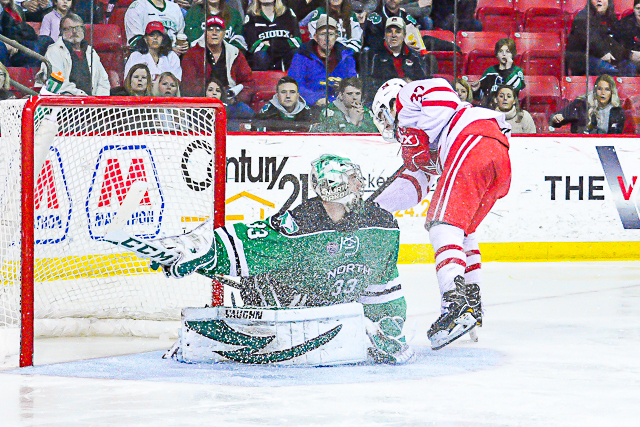 At first it appeared Johnson had made the save, but the referee by the net ruled it a goal, a shorthanded tally at the 4:23 mark of the middle stanza. 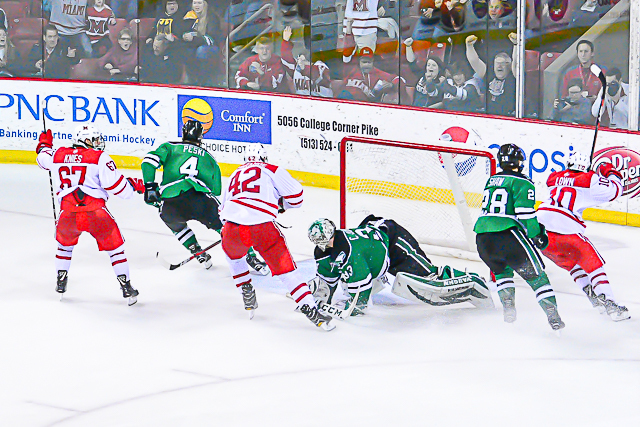 The RedHawks made it 2-0 just 26 seconds into the third period when Carter Johnson slid a pass through the slot that Kiefer Sherwood rifled home. 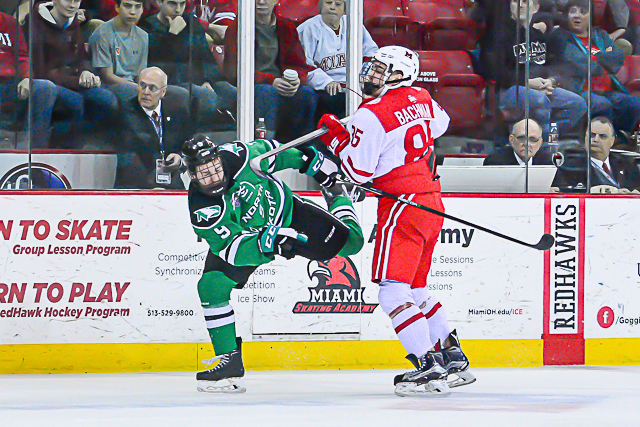 But at the 4:20 mark of the final frame, a shot by the Fighting Hawks’ Hayden Shaw from a bad angle hit the glove of Miami goalie Ryan Larkin and trickled in. 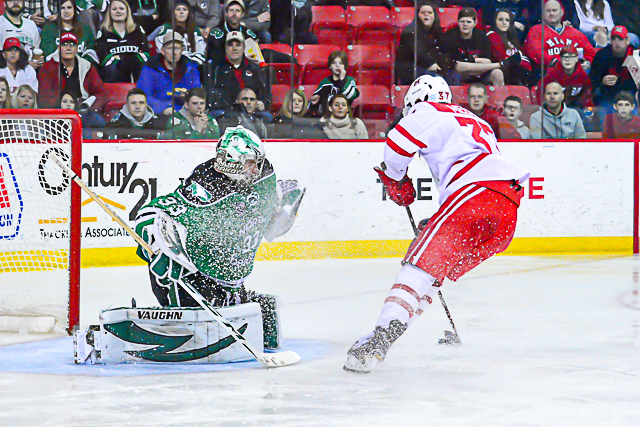 Exactly three minutes later, UND’s Nick Jones redirected a blue-line shot by Colton Poolman to tie the score. After five minutes of 5-on-5 overtime, Sherwood found the net in the 3-on-3 to give Miami the extra league point. STATS: It was the ninth goal of the season for Melnick, and Sherwood scored his seventh. 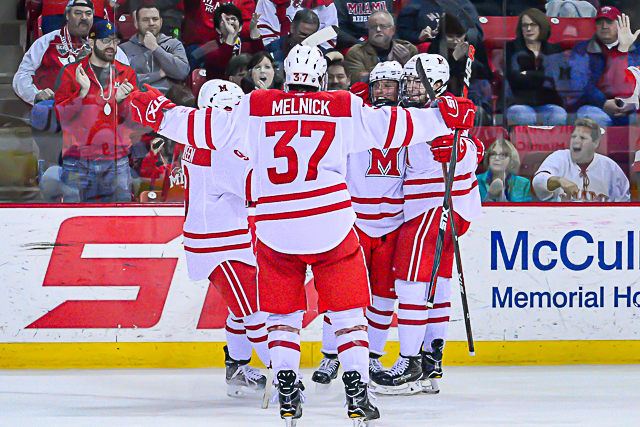 Melnick led Miami with three points on the weekend. 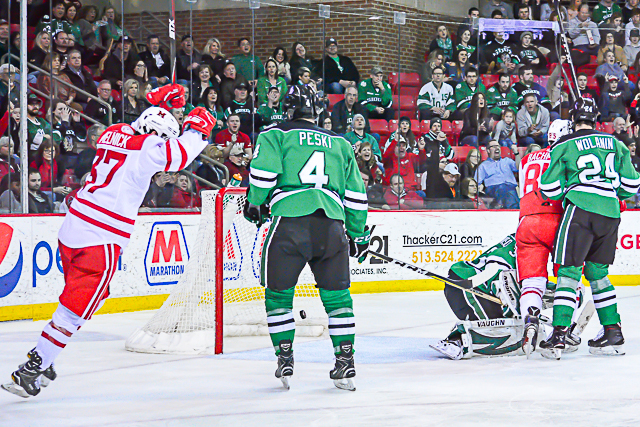 — It was just the second time in 14 games the RedHawks allowed fewer than two goals. — Make that six straight games with neither a power-play nor a first-period tally. — And Miami still hasn’t won a Saturday game since Nov. 18. 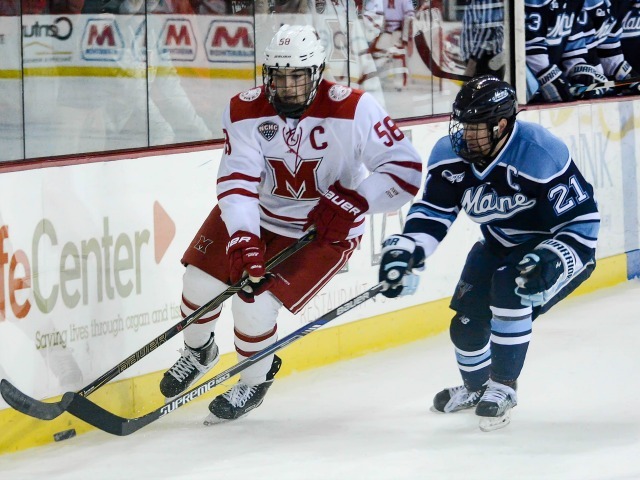 — Both Melnick and Louie Belpedio reached 80 career points this weekend. Melnick has 27 goals and 53 assists, while Belpedio has scored 25 times and dished out 55 assists. Belpedio is a senior while Melnick is a junior. That duo is tied for the team lead in active career points, and Sherwood is two back with 32 goals and 46 assists for 78 points. He’s also a junior. 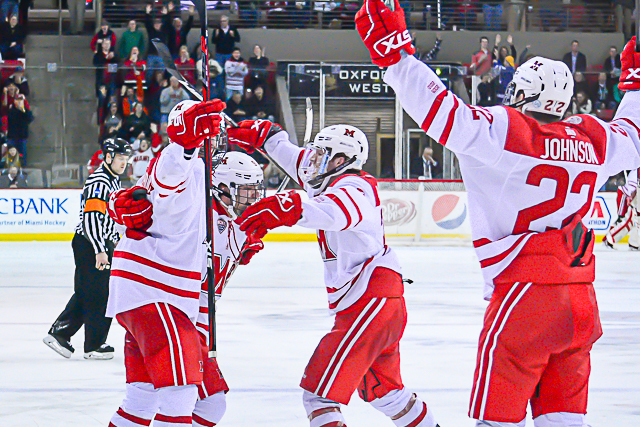 Happy with a 1-0-1 weekend against North Dakota? Of course. Is Jack Johnson still hated in Oxford? For the most part it was a very well-played series by Miami in a down year against a national power. Cady Arena was rocking and these were two extremely entertaining games to watch. But it’s hard to be happy about yet another third-period collapse. Winning the 3-on-3 skills competition point does nothing to assuage that. 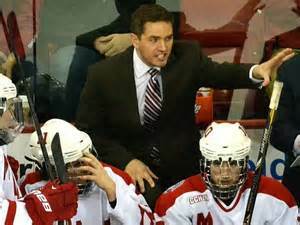 When the final chapter is written about RedHawks Version 2017-18, near the top of the list of what went wrong this regular season will be the inability to close out games. And this has been a problem for a number of years. Miami has shown glimpses of excellence this season, but it cannot afford to continue flipping wins to ties and losses. — Not happy with the penalties in this game on multiple fronts. 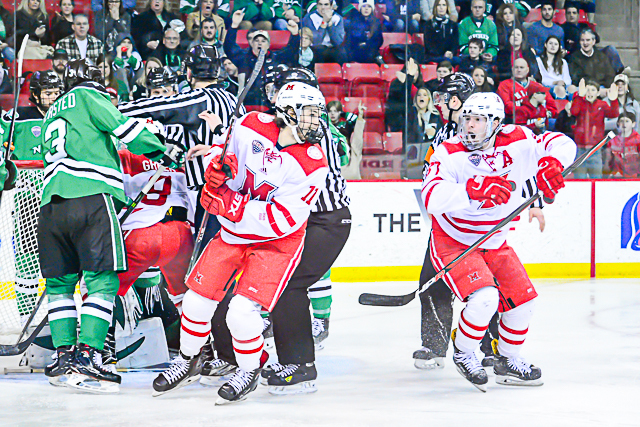 Karch Bachman was taken down in the second period by a player also committing interference and possible a felony or two and there was no call. A too-many-men call was missed. 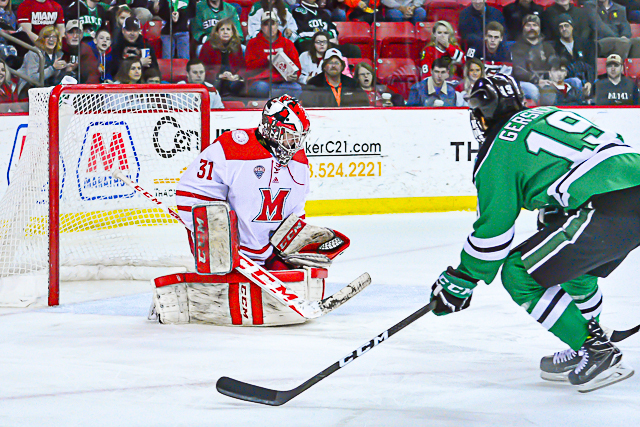 Miami had one power play, North Dakota (14-11-9) three including a major. 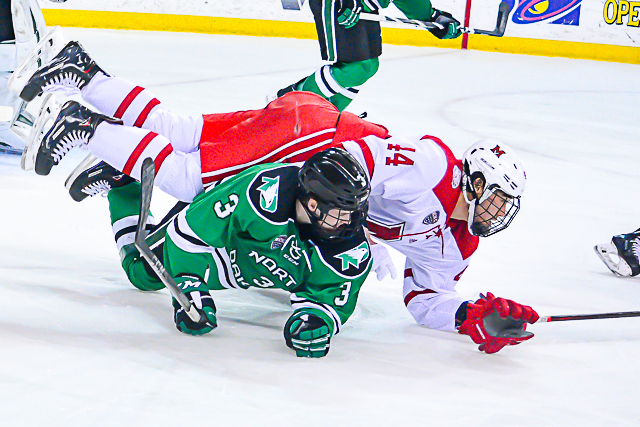 That’s a night after concurrent minors against the RedHawks resulted in the Fighting Hawks’ second goal on Friday. 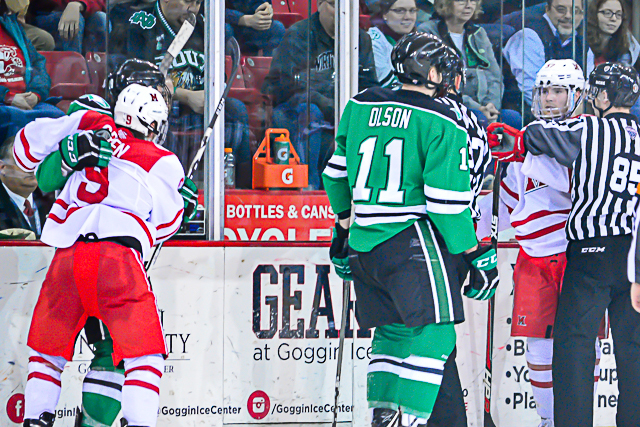 Penalty minutes were 19-2 on Saturday. 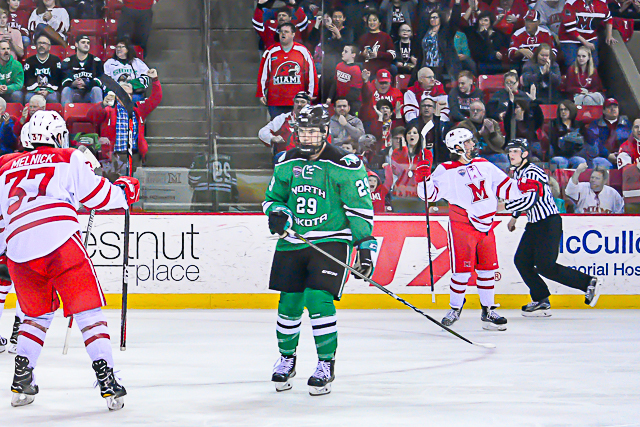 — That said, Rourke Russell’s minor penalty was undisciplined, and Carson Meyer’s major was deserved. Russell had just turned the puck over and took a blatant chop at the steal-ee. Meyer saw numbers on the back of jersey and barreled into his guy anyway. That’s a major in the NCAA. 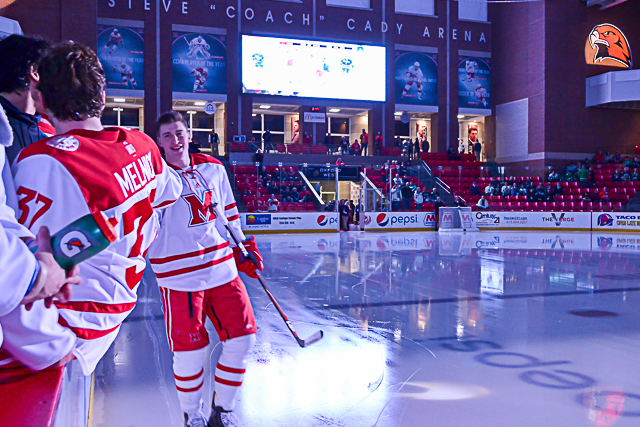 — Speaking of the Meyer hit, someone decided to make that the hit of the game on the scoreboard at Cady Arena. A dangerous hit from behind. A major penalty and ejection. 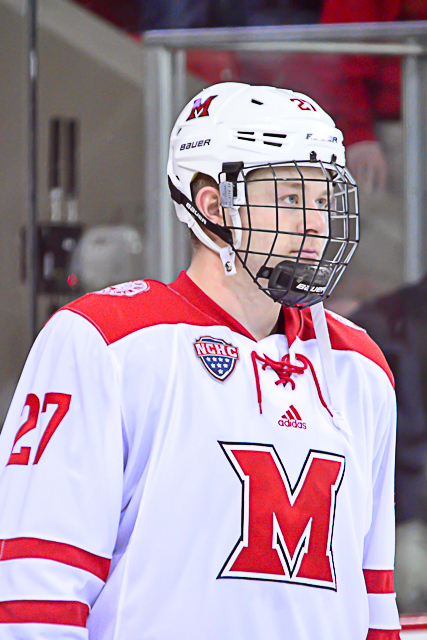 — Miami looked extremely tired in the third period. Second game in two nights, of course, but that’s true of every team in college hockey in the third period every Saturday. It was unusually humid and warm for this area in February, but again, both teams had to deal with that. — With this being the final home game, I think it’s time to lobby for some additional players’ numbers to be added to the Zamboni end walls. Andy Greene has been out of Oxford for 12 years. It’s time his name goes up. Ryan Jones graduated in 2008. Same goes. A decade plus on both. What in the world is everyone waiting for? The first two are no-brainers, but I’d add Andy Miele to that list as well. 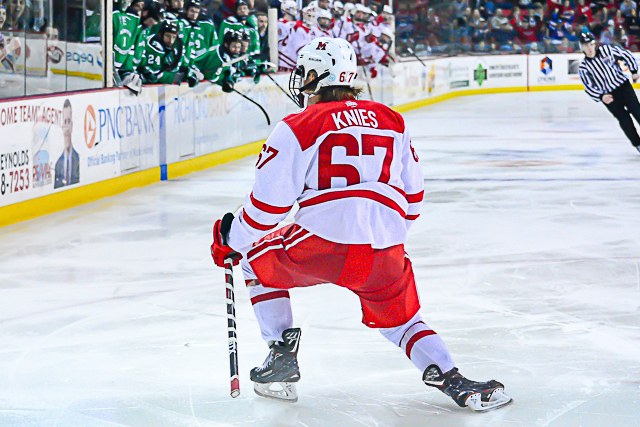 He won the Hobey Baker seven years ago. That’s long enough. In two years, add Austin Czarnik. 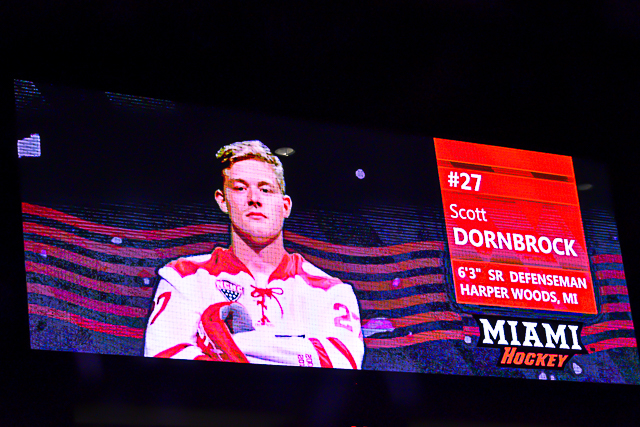 He’s already been gone since 2015 and he epitomized Miami hockey values both on and off the ice as much as anyone else on that wall. 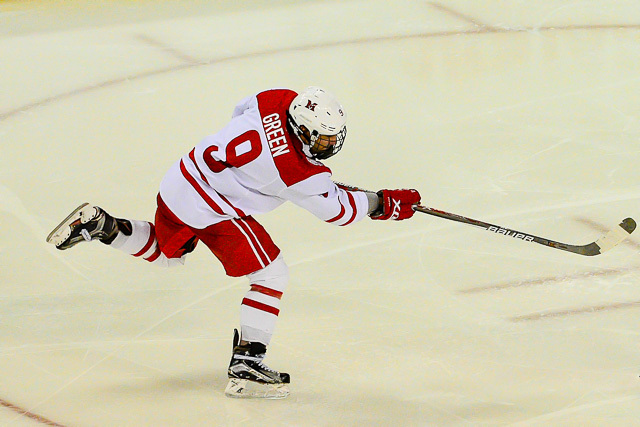 FORWARDS: C. Sherwood finished with seven shots and Green had six. It’s so nice to have Sherwood playing as well as he did in 2016-17. Melnick created his own goal with the steal in his own zone, and Sherwood’s came after Miami won board battles, so both markers came off of hard work. DEFENSEMEN: C+. 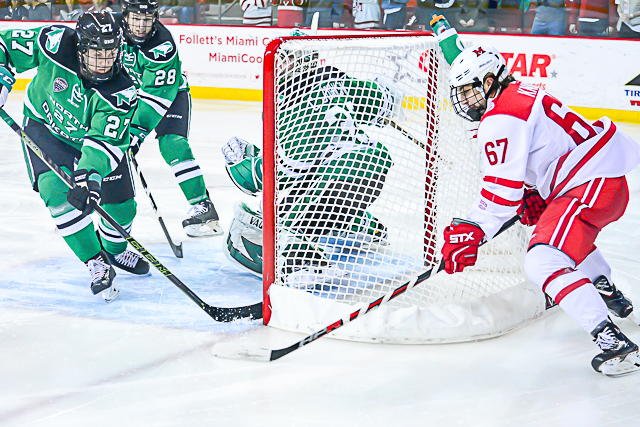 North Dakota controlled the puck more than Miami, so it’s sort of comme ci, comme ca to point out that Grant Hutton, Alec Mahalak and Chaz Switzer all blocked three shots, and Scott Dornbrock added two blocks. 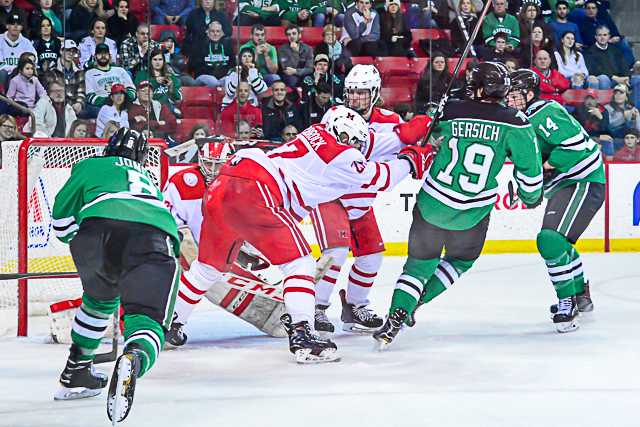 Russell took two penalties and one of those chances resulted in a North Dakota goal. GOALTENDING: B. Hard to fault a guy for a tip-in from the slot, but the first one was all Ryan Larkin. He should’ve gloved the puck but it bounced out and into the net. But he was 28 of 30 and made some outstanding saves. LINEUP CHANGES: None. This looks like the 19 that coach Enrico Blasi will ride into the NCHC Tournament. 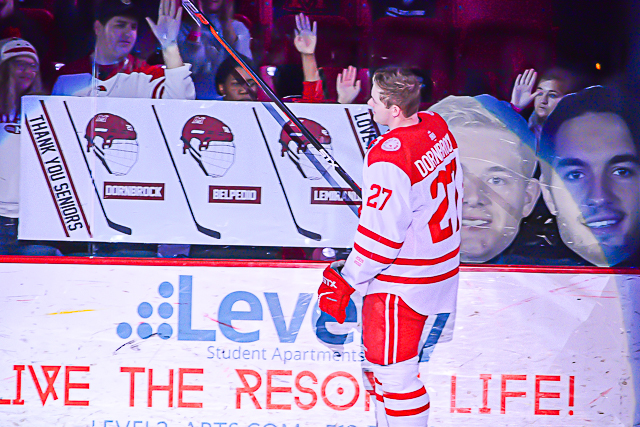 FINAL THOUGHTS: It was senior night, and overall a 1-0-1 weekend vs. North Dakota is a great send-off for Louie Belpedio, Scott Dornbrock and Conor Lemirande in their final home series. Unfortunately, this class made the NCAA Tournament just once, and that was their freshmen seasons. 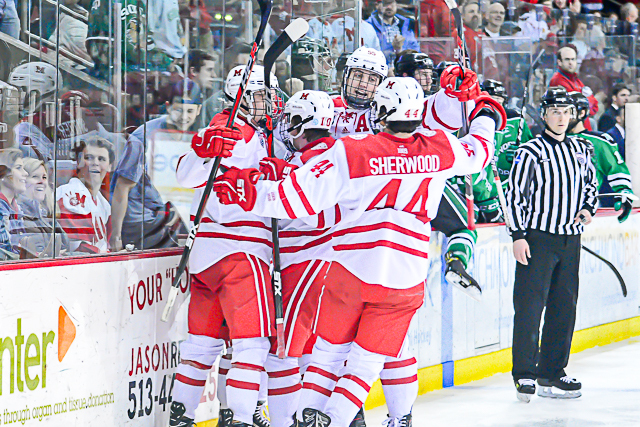 Miami will finish last in the NCHC for the second time since the league’s inception in 2013-14 and will head to the road for the fourth time in five years to open the league tournament. In the eight-team conference, the RedHawks have finished eighth, second, fifth, seventh and now eighth again since joining the league. 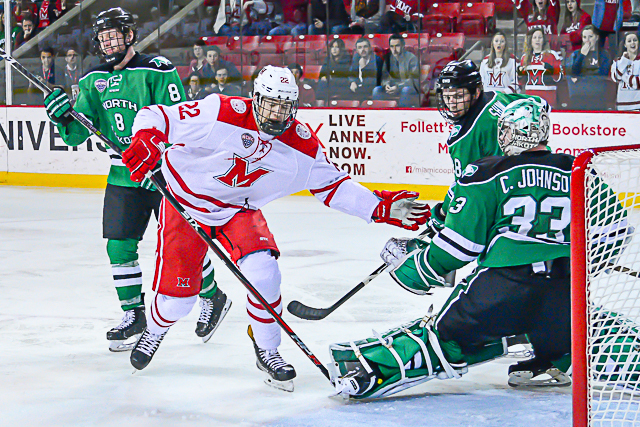 Next weekend, Miami heads to Denver for a series that means zilch to the RedHawks in terms of points/seeding/NCAA Tournament qualifying. The focus now is all on their series at St. 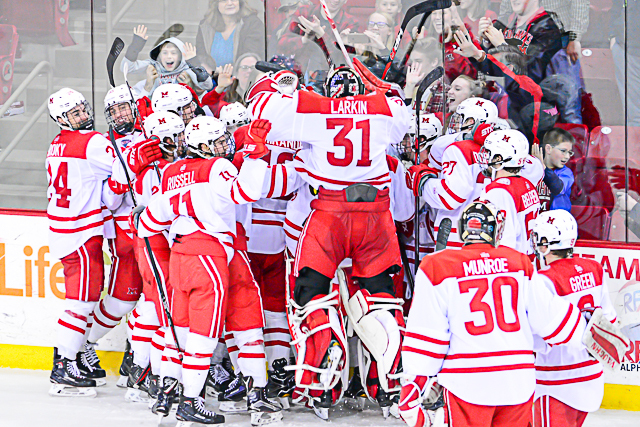 Cloud State in two weeks.